The retro gaming scene has changed a lot in recent years, with values climbing up in many cases; it can be an expensive business picking up some games and systems from decades gone by. There must be money in it, as GameStop is ramping up its retro offerings and even taking trade-ins on old consoles and games. Trade-ins are in-store only, and at the moment it seems to be limited to the US - we can't see similar advertising on EB Games for Canada of GameStop's UK site. It seems that if you take an old console or games into store it'll be down to the manager to decide whether to take them. The Retro Classics page also has lots of retro games and gear on sale, though it seems likely they'll be premium prices - examples include $79.99 for a Nintendo 64 or $54.99 for a copy of Super Smash Bros. Melee. GameStop, in all likelihood, will be hoping for trade-ins and sales from gamers looking for a quick purchase or sale, rather than relying on flea markets or online auction sites for the best deals. Ultimately, we doubt this will be useful for too many serious collectors, but as a convenient option with a retailer it's worth noting. As always, though, think carefully before trading away your old games and systems - their value may be higher than you think. Starts? Hell I'm so old I remember when they did the first time around! I also remember when they were buying out much better gaming stores like Rhino Videogames and ultimately becoming the abomination they are today. This is the way it always should've been then the prices wouldn't be so outrageous now. Never traded in any of my games or consoles... my friends often tell me my collection would be worth a small fortune, but I still don't have any intention to sell them. This is funny because GameStop lost my business years ago because of this very thing. Maybe I'll check in with them from time to time now. There's just plenty of retro game shop options in my area. GameStop is a steaming pile of garbage. I bought one too many "New" games from them that we in fact used with save files. Do not support this business. I'm always glad to see retro systems on the high street. They should never have stopped selling them in the first place, there will always be a market for people rebuying stuff they owned as a kid, or even buying something they always wanted but couldn't afford. I remember as soon as I started to make my own money I went back & bought all the old stuff I read about as a kid but couldn't afford - 32X, Mega CD, 3DO, Jaguar, Lynx... back then those were deeply unfashionable systems & the games were being sold for next to nothing. I also bought older stuff I had wanted but not owned like a Amiga 1200, NES, C64, Spectrum... I had an absolute blast! The only thing I ever regretted was the CDi. Never found a game I liked for it. Gamestop in the US have been doing this for a while online and in I think only 2 of their US stores. They big upped the entire thing about having a processing and refurb plant, with specially trained testers and cleaners and all that poop. Most of what has been sent out has been fake, untested, grungy junk. There are so many reports of people buying games that has different roms inside them, throws their "testing" right out the window. I know of maybe 4 or 5 retro shops here in Ireland, the prices are generally harsh but when I worked for Gamestop earlier this year, we were already phasing out DS/Wii trades. 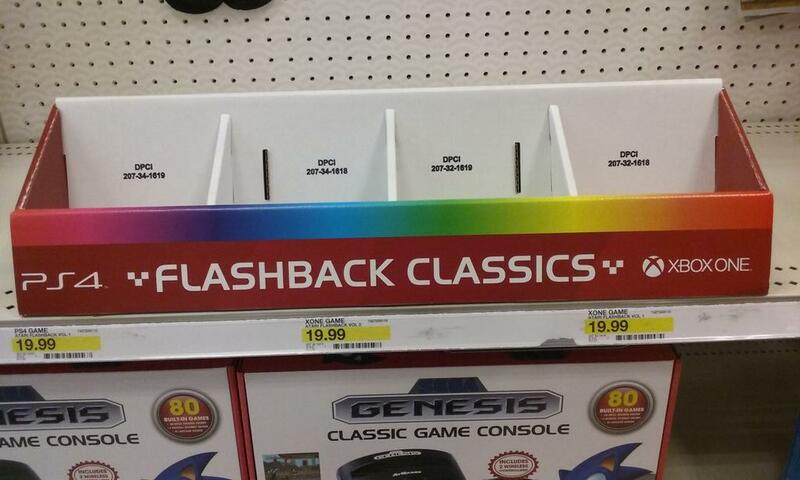 edit: I haven't looked but I hear the prices are generally in line with what other retro stores sell them for. Which is usually a small bit above "value". Gamestop also haven't been touching big ticket items ($100+) through the online system so I doubt that'll change here. Agreed. I never trade in any of my old consoles (never know when the itch for retro gaming may come) and since they are in mint condition, they usually joke that I have a nice fund in case of emergencies. Nothing but a big emergency could get me to part with my old Pokemon Red cartridge - which still works, by the way! Traded in my PS2, never again. 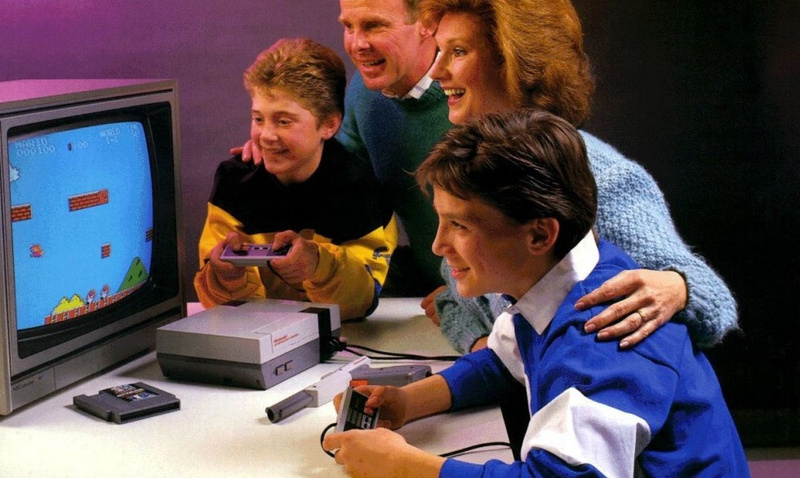 "Retro" is the big word this holiday, I think Nintendo either started it w/ the NES Mini or somehow just caught the zeitgeist at the exact right moment. But since I don't believe in coincidences I'm going w/ Nintendo starting the trend. Couple of photos I took in the Target videogame section about a month back. Sega, Atari and retro swag. And I think it's funny even PS4 and X1 are getting in on the act. When you got nothing new to sell, sell nostalgia. I really need to get a NES. Only system I ever sold. I just want to have the power glove back. I'm glad they are finally rolling this out to all stores. Since this has been in beta for nearly a year now. Been expecting this since 2005 when I had to help pack up my gamestop's n64 selection and send it to Gamestop HQ. After we bought as much as we could afford at 70percent off of course. Anyone who has traded anything in that I know has regretted it. Gamestop are mercenaries. 50p for your N64 and we'll sell it for you soul shall we? So much wrong with that image. Can you spot all the errors? To buy as a collector yes...to trade in? No way Jose!! Gamestop rips u off on trades! Why would anyone want to trade in for peanuts when you can make more than double selling on ebay, I've spent the last three months pricing up all my games and consoles for insurance purposes and i have at least ten grands worth of gear but with trade I wouldn't get a third of the value. @Thomas - You got an "of" in stead of "or" here. "EB Games for Canada of GameStop's UK site"
Could be useful. I rarely trade in games but there are a few old ones that if they were priced like new titles would be cheaper for me to find, of course I'll explore the normal options I have first because there are some very reasonably priced retro game sellers around me. 2 controllers plugged in, which is fine, but they imply that both kids are playing mario at the same time, but it's only 1 player at a time. The zapper is sitting there unplugged because they have a mario/duck hunt dual cart, which makes sense.....but wait....how are they playing mario if their dual cart is sitting there? It's unlikely they have a mario cart AND the dual cart! It also looks like the kid is jumping left, to his doom. No visable AV/power cables, but they could just be "out of view". Did I miss anything? Oh, and only the kid in yellow/black seems to be looking at the tv. Everyone else looks like they're looking around it. @Jd12345678 - this is by far my biggest issue with Gamestop. I have reserved new games coming out and went to pick up my "new" copy that was opened and the disc was in a disc sleeve. I asked them why my reserved copy was now open and they told me they had to have a display copy for the game. When questioned further I came to understand only one copy came in to the store. So I assume they were prepared to sell my copy. I got my refund and never stopped there again. @Menchi187 Very good. Did you read my post on GoNintendo? The power button is the biggest gaff. All your other points are correct too. Doesn't the Dad look like Will Ferrell's father? You be mad to trade in your retro games and consoles for the prices I'm sure they're offering. The GameStop where I live I wouldn't go near the place. The prices are scandalous and new games are opened and covered in stickers. Horrible place. Cex, Argos and online is where I buy my games. As modern systems move towards digital downloads it makes sense to have shelf space for retro games and machines. @SLIGEACH_EIRE No, this is the only Nintendo site I use and even then, not much. I actually did think he looked like Will Farrell funny enough, rather than his father. @Menchi187 He does look like Will Ferrell but back then he would have been a teenager so I said his father. "Here's $5 store credit for your Flintstones 2 and Little Samson." This isn't news this has been going on for a year or so now. There's even been times when people got fake games from Gamestop and one guy got a Chrono Trigger with a Madden game inside the cartridge. Why is this even on here? This site is based in the UK, what relevance is this to UK readership as it's limited to the US? Maybe because there are a lot American readers, like myself? They cover multiple regions. I'm sure there are North American sites that cover UK news as well. It's just a waste of bandwidth. I'm sure yank readers can get this news elsewhere. I got a good deal on my NES top loader from Gamestop. It was cheaper than ebay and in great shape. If it's like CeX in the UK, they'll buy games for 1 tenth of what they'll sell them at. Do we know if Gamestop fixes/replaces the batteries in games that have native saving? If not, then people aren't gonna get far in games that had saves, no? The only smarmy here is you. Dumb-dumb. Gamestop regularly destroys excess stock. Second-hand items are better handed by someone who knows the long-term value of them. Gamestop only has the shelf space for very select games. The love for and fascination with classic/retro games just blatantly underlines that today's games pale in comparison to the fun & entertainment value of games of old. Developers should pay close attention to this as they continue to axe these genres of games as the years go by and wonder why sales slump. I've kept all my old systems, dating clear back to the Intellivision and they are still always just as fun to me today as they were 35+ years ago. @The_Dude_Abides No profanity please, censoring doesn't work here either. @Clownshoes That goes for you too. The glory days of Funcoland... how I miss them. When retro was NES, SNES, Genesis, GB, Gamegear essentially. I'm sure another dedicated retro emporium retailer will arise one day. Only thing I buy from GameStop is exclusive stuff, even then I regret it afterward. Here is why retro gaming at GameStop is a terrible, terrible idea. If you need to sell any game, retro or new, do it via EBay. You get much more money per sale and it's real easy to use. @SmaMan Ha! That's hilarious and terrifying! Besides the fact that retro games are slightly harder to confirm that used copies still work properly...trading in to gamestop is a terrible idea in general. I mean, have you SEEN the prices they give? They'll charge you $40 bucks for a used game, sometimes that isn't even NEW and previously had a lower price (cough*Bravely Default*cough) but you'll be lucky to get more than $10 back for that same game in the same condition. I love the idea. I already purchase old games off of ebay. It would be nice to go to my local GameStop to pick something up. CEX in Walsall has started selling N64 games, I find it strangely reassuring. Now where can we get ripped off? @rjejr We have almost that exact section locally as well. Though our ties are better. I also imagined that the upcoming mini NES was an impetus for sectioning it off like that. Like you mentioned before they used be endcaps and have nowhere else to live (or sometimes next to board games). For any of you retro fans, Atari just released 2 discs for the PS4 & Xbox one. 50 games per disc of mostly 2600 games but also includes the original arcade versions of games like asteroids, centipede, tempest, millipede, missle command, black widow and others $20 each! Also u can get digital versions if you prefer!! Enjoy!! As that video shows, there's a chance you could get stuck with a repro cart (i.e. not the original at all, maybe not even the game the label shows you) but of course there's that chance even on ebay (look at the seller's reviews and rep). Unless Gamestop is offering really cheap prices compared to what you'd pay on ebay, just stick with ebay! Those pictures just come across as so damn cheesy, imo. Stock photos of Stepford families. Ugh. @dronesplitter That's true, and if they charge the same price as for an original then it's a ripoff. But if they integrate repros and sell them at a fair price, that could be okay. Lots of people out there who want to either just play the game on original hardware afforably OR want a patched/hacked repro for translation/weirdness/other perks (like Seiken Densetsu 3's multiplayer hack)! Buying used games for single-digit prices and reselling the same for $1 less than brand new copies? Selling "display copies" as "new"? Charging high shipping costs and tax for all online sales? Grimy interiors and braindead, condescending employees? How is GameStop still even a thing? They ate up Babbage's, Funcoland, and EB Games along with the associated quality, service, and selection of each of those stores. One of the worst businesses I know of. And no, they will not trade a "kid" for a "grown goat" alone, but will trade you one for your entire "barn", despite what their deceptive new commercial implies. Eight years ago, I reserved Fire Emblem: Shadow Dragon from a GS, only because its lithograph reserve bonus was exclusively at GameStop. I paid in full for it. When I came to pick it up, not only did the store not have the bonus, but the manager yelled at me for asking. A year later, wary of my previous experience, I reserved Tatsunoko vs. Capcom at the same store in order to get the trading cards reserve bonus associated with that game (again, only available at GameStop), but got nothing...again (though the manager, apparently recognising me, gave me a bunch of random reserve memorabilia that he had behind the counter as consolation, though that didn't change my mind about their terrible service and false promises). So, that was the last purchase I ever made there, and I have no regrets about that. People, do not be fooled into selling (or buying) games to/from GameStop, even with their promotions for which game companies are always partnering. Save yourself some time, stress, and heartache by buying/selling at Ebay and Amazon, or perhaps at a local electronics store. Or even a catch-all store like Target or Wal-Mart. Absolutely anything else is better than this place. Even you just want to browse the latest stuff there or are there just to download a promo Pokémon or something of that sort, don't be lazy by giving GameStop business they don't deserve while you're there. You'll do yourself (and your wallet) a huge favor. A nintendo 64 with Expansion Pak, Goldeneye, Mario 64, Turok 2, Body Harvest and Conkers Bad Fur day? We will give you 20 bucks! A nintendo 64 with Expansion pak, Goldeneye, Turok 2, Body Harvest and Conkers Bad Fur Day! @Gauchorino I think you are making gross generalizations about shopping at GameStop. Their trade-in model is based on what the market will yield and obviously works for them and for a lot of their customers. I've had good experiences at my local GameStop, although I can certainly understand you've had poor experiences there. If you don't like shopping there, pretty simply, don't shop there. GameStop is what it is, but I wouldn't justify calling them braindead, disgusting or deceptive. @CosmoXY Every statement from my first paragraph is universally standard GameStop fare, and based on the vast majority of similar sentiments in this comment section alone, I don't think my evaluation is innaccurate nor of a minority (even if we disregard my detailed personal experiences above). Trading in a game for a tenth or less of what it originally sold for (no matter how high profile the game may be) is atypical of market yield. One look at Ebay or Amazon Marketplace, for example, gives you a much better understanding of the actual market value for a particular game. Unlike those and related systems, GameStop arbitrarily buys and sells used games at whatever price they like, without question or negotiation. They continue to remain successful because of strong and obscurative marketing tactics, not due to competitive service, pricing, or even selection. I don't have to frequent a place to criticise or review it, and I am perfectly within right and reason by doing so now. Your overall positive experience at GameStop is fine (and by all means, support the businesses you like and that you feel are beneficial to you), but is anecdotal evidence (which, standing among the mostly negative experiences, indicates that your experience is an outlyer); the exception proves the rule. @Gauchorino You may hate them, call them names and have some personal grudge, which is fine, that has no bearing on me, but clearly and obviously (whether you choose to believe it or not) their business model works for them and many of their customers. If it didn't, they wouldn't still be in business. Can't really argue those facts. @CosmoXY But I'm not arguing against that (though you could defend McDonald's likewise). I'm saying that it's a terrible business that preys upon ignorance and perceived convenience. I'm also saying that there are other businesses that sell the same wares in far better ways.